Johnny Edward Tilley was born on January 31, 1943 to Noel Haskell and Maime Hellen (Streater) Tilley in South Gate, California. 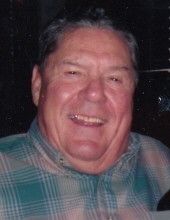 He departed this life on April 10, 2019 at his home in Strang at the age of 76. Johnny graduated from Wewoka High School. On March 26, 1993 he married Judy Gilchrist in Hominy, Oklahoma. He later moved to Strang where he has lived for the past ten years. Johnny was an oil field worker most of his life. He attended Greenbrier Freewill Baptist Church. He enjoyed fishing, cutting wood and being outdoors. He also loved gardening and canning. Johnny was a hard worker and a devoted family man and he will be deeply missed by all who loved him. He is survived by his wife, Judy, of the home; three sons, John Tilley and wife Brenda of Eufaula, Bob Tilley and wife Gidget of Seminole and Edward Tilley and wife Jennifer of Kansas City, Kansas; seven grandchildren, Jennifer Starnes and husband Johnathon, Jessica Mosley and husband Heath, Julie Withrow and husband Joe, Bobby Tilley and wife Ashley, Amber Yott and husband Jason, Clayton Tilley and Kennedy Tilley; nine great grandchildren and several nieces, nephews, other relatives and friends. He is preceded in death by his parents, Noel and Maime Tilley and his siblings. To send flowers or a remembrance gift to the family of Johnny Edward Tilley, please visit our Tribute Store. "Email Address" would like to share the life celebration of Johnny Edward Tilley. Click on the "link" to go to share a favorite memory or leave a condolence message for the family.